Hotel itself was excellent, clean, modern well situated in the town close to the beach. Downside food was not very good, the snacks given for all inclusive guests were terrible. A lot of unaccompanied child groups. Mixed views on Hotel Cervantes! Stayed in Hotel Cervantes during the first week of July 2014 with my partner and 2 children aged nearly 6 and 12. The hotel has a good location beside the main shopping street and cafes etc. However, it is a walk down many steps to the beach. If you like sunbathing this hotel isn't ideal -you will need to line up at 8am to attempt to get a sunbed. The pool area is far too small for the amount of guests in the hotel. The food on all inclusive was of a fairly good standard, you won't go hungry. My kids enjoyed the kids club which was on both morning and late afternoon/early evening. I wouldn't return to this hotel in the summer months due to the pool situation. I also found the staff on the reception to be quite unhelpful, especially when I complained about the safe in my room not working, it got stuck twice in a week with all my valuables inside. I was told I had too many things inside it. I tried to extend my room on the last day as we had an evening flight. This wasn't possible as the hotel was fully booked. All inclusive ends at noon on your last day unless you pay 10 euros per person to obtain the all-inclusive drinks. Entertainment is awful and practically non-existent, a game of bingo or a bird show isn't really 4 star entertainment! Hotel tip: Choose a low floor to avoid queuing for lifts. The hotel on arrival looked lovely .clean and spacious. Hotel reception seemed to take ages to get checked in. Once in the rooms were basic but clean with free bathroom accessories. TV and hairdryer. We did have to ask for more pillows. These arrived later that afternoon. We went to lunch first signs looked ok. But as time went on. Things were scattered all over .butter not near the bread or spreads at breakfast. Hot food spaced out so you have to wander around looking for everything. The food was never very hot and sometimes when dishes were empty the staff were not always fast at replacing them. The coffee machine only had hot milk but no cold milk near the machine again on for the search for milk. Most of the staff was friendly although some of the bar staff could be miserable at times. All inclusive wasn’t that inclusive. Very small glasses of beer not even half pint. And often only two drinks per person. If you were half board you could buy beer in pints but staff would not offer if Inclusive. There were six of us in our party and then we met other people we had quite a crowd but most of were having to go to the bar .then when the hotel was full. Queuing at the bar. The bar staff only gave two drinks and asked us to come back. Which meant we seemed to queue constantly for a drink. No cocktails if inclusive. Bar open 11/11. Reception bar turned everything off at 11.no warning they simply turned off the machines and lights. The second bar only opened on certain night when the entertainment played (Spanish bloke on a keyboard) 4 nights out of the 7.this meant you could not get a hot drink at 11pm. Then in the morning no drinks hot or cold till 11am in the maim bar. Juice and coffee was available till 10 in the restaurant during breakfast. But this proved difficult if you've been for breakfast at 8, then people were queuing for breakfast. I tried to just walk straight in as I didn’t need a table and the waiter sent me back to back of the que.so remember to take your own kettle and coffee to have in your room. No entertainment or back ground music. We went Christmas and although the dinner was lovely the lack of atmosphere let the day down. Nothing for kids to do. Little game room with pool table not working and air hockey one euro per game.it ends up costing a fortune each night. If you got kids pay for a week of Wi-Fi at 20 euros. I only paid for one night mid-week then got pestered for another and then another so it cost 15 for three nights. Plus nearly 20 for games room. Hotel tip: Very clean and spacious ideal for those who just wamt to get away. not great for kids or those who want some atmosphere. we went at christmas so definatly wanted some fun single rooms have a large corner balcony with no single supplement. Train station about 200 metres from hotel, arrived at 10.30 am and my room was ready, part sea view. Plenty of choice at lunch and dinner also breakfast, the hotel was almost full but did not have to wait for anything which was great. The drinks were served in plastic glasses unless you ask then no problem. 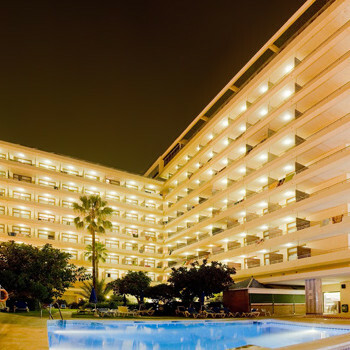 For what you pay its very good value, we go away 8 times a year and this is one of the best all inclusive hotels in Spain, everywhere in hotel is spotless. Indoor pool was warm and would go back tomorrow if I could. Hotel was nice and clean, in a good location for the shops. Beach and public transport should you want to tour the area. Because of the time of year it was not too busy. Too cool to use the outside pool but the covered roof top pool was great. You would not go hungry at this hotel but you soon get board with very similar food every night, not a lot of variety, chips every night and we only had boiled potatoes once. Rice or baked potatoes would have been nice occasionally, but what there was cooked ok and tasty. Most of the hotel staff were very friendly but as it was said before the reception staff were a bit frosty and abrupt. We got a good price for staying at this hotel and for what we paid it is good value. We would stay there again. Location is good only a short walk to the bars cafes and restaurants and beach. Just returned from a lovely week at the Hotel Cervantes. Rooms were pleasant & most have a gorgeous sea view. Situated up the hill from the beach but there is a lift available just at the bottom of the street or winding steps down from the end of San Miguel. B&B stay - plenty of choice - even though it was usually nearer 10 before we went down. Some of the reception staff not too friendly but everyone else very nice. When notified we hadnt enough towels, the guy from reception was at our door 5 minutes later with a pile of lovely warm towels. We didnt venture to main pool as was always very busy - the rooftop pool was much quieter. Hope to return in the near future. Torremolinos is a lovely place and VERY clean, much quieter than anticipated. Return visit to this hotel in centre of the town. Noticed a lot of work currently being undertaken and enterance only available from plaza. The reception area has been moved slightly on a temp basis as work continues - although there was no noise during the one night stay. Standard twin rooms which were fine. The lifts remain a problem here during certain times when the hotel is busy. It is a large hotel and more lifts are needed for the 7 floors of rooms and rooftop at level 8. Staff were more friendly than last time at reception. The cake choice was sampled and given thumbs up. Breakfast is most certainly geared towards British customers and personally a little off putting in my opinion. However the rolls and bread were fresh. A larger selection of meats/hams/cheese etc for morning breakfast for the non Brits and those who can do without Beans and whatever - would have been lovely. As standard in Torrie, coffee etc dispensed from a machine - but not too shabby. Bit noisy in the breakfast room with much British dialogue - mixed with sprinkling of German and thankfully Spanish. Suspect though that during peak summer time it could be a little caotic. Overall though, the hotel holding its own within good part of the town and easy access to railway station if required. We were staying in Fuengirola and saw an advert for 3 days in a four star hotel for Christmas. We arrived on Christmas Eve and had to take cases up countless steps to front entrance - no ramp. The room was not bad but did not have any tea making facilities or fridge. We had to queue for our evening meal as staff had gone home for christmas and only a few tables were in use. The food was sparse and cold. In the bar there were only two staff serving and there was no music, entertainment or atmosphere. We were back in our room by 10.00 p.m.!! The Christmas lunch was only catered for the locals - fish soup and pressed turkey with dates! We packed and came home giving up 2 days of our holiday. Spent two nights at the hotel. Thought the check in staff were rather poor actually. They even asked us how much the room was despite us giving her the internet booking detail. (was a great bargain though at 74 euros for the two nights). The room was very spacious and also quite noise resistant. Always a plus sign for me. Was on the 6th floor and had quite a nice view - although I would be a little concerned if travellers have children as the balcony railing just does not seem high enough to be fully safe. The hotel is large - yet had only 4 lifts that were in constant use. Q's did happen. The hotel pool area and poolside bar are getting varnished and re painted and I think they will look very smart when finished. Breakfast was plentiful and the buffet style did offer something for everyone. Shame tho' like many hotels in Torrie - the coffee comes from a machine - but was drinkable. Car parking does cost 10 euros a day - however off street parking can be found close by. The hotel is nicely located for shopping and only 2 minutes walk to the railway station. Hotel requires total re-furbishment-no fans in bathroom,bed covers very tatty. Food was tedious unless you like veal or pork stew every day.Breakfast was acceptable. Hotel staff very pleasant and the hotel itself is very centrally located. We would not go to this hotel again unless they revised their food menu,to call this hotel 4 star is delusional. We were very disappointed as it was more like a 3 star and the powers that be should should downgrade it as such!